The Two of Swords. Peace. Calm. Inner Tranquility. Putting Aside Differences. Avoiding Conflict. Blocking Emotions. The Two of Swords corresponds to the Sefirot of Chokmah; the first manifestation of the seed of Kether, and the original harmony and power of creation. It is the energy and idea of the Suit of Swords given original harmonious form; it is the first appearance of logic and abstract thought and ideals. What better way to express abstract ideals of truth and justice than through the idea of Peace? By putting aside differences and avoiding conflict, thinkers can come together and help build the world, making it a better place. Peace allows for thought to grow, and is the result of the application of the principles associated with the Suit of Swords. The card’s association with inner tranquility also is the representative card of the philosopher and thinker; those individuals who commonly exemplify the Suit of Swords. These logical thinkers must block out the influence of their emotions of their thought is to be true, and so often this tranquility is emotionless. 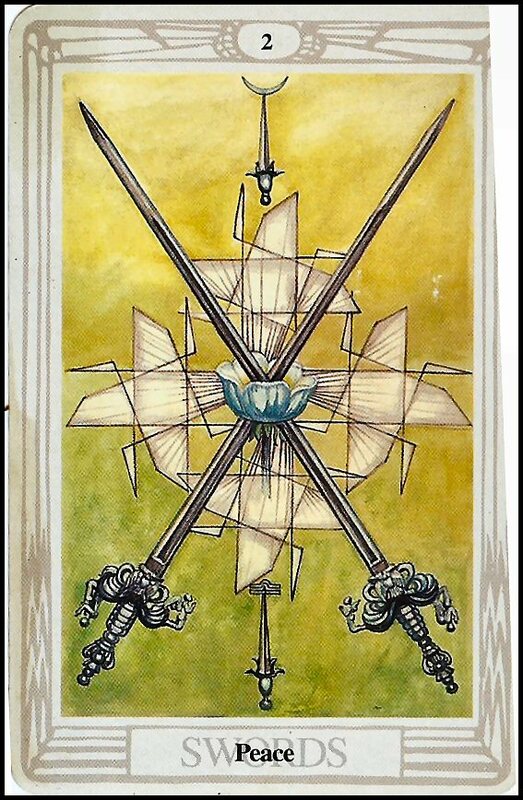 This card embodies the mental state – the abstract ideas – associated with the suit of Swords with regards to oneself, and so is the mental harmony of Swords: that is, Peace. The Rider-Waite illustration shows a woman sitting on a stone bench, blindfolded and holding two swords across her chest defensively. She is blocking herself from others, and is focused on herself and not her environment, as is seen from the blindfold. She is peaceful and calm, and also alone – she does not let her surroundings disturb her sense of calm. Behind her is the sea, which is also extremely calm. The Thoth art shows two crossed swords piercing the center of a flower and keeping it suspended and stable, while not actually breaking or destroying it; the background shows many angular geometrical patterns, emphasizing the stability and logicality of it all. Below and above this central motif are smaller swords. This card emphasizes the idea of calmness and tranquility, and self-examination and lack of conflict; the swords are not locked together to fight, but to make peace. In a reading, this card asks you to examine your own mental state; are you calm internally? Are you blocking your emotions? It also asks you to look at your environment; is it free of conflict? Should you put aside your differences and work together with someone else to build a better future? Reversed, this card’s energies are present but hidden or twisted in some way; does a particularly rambunctious individual actually know internally where he stands? Is the banter and apparent conflict at your workplace really actually signs of putting aside differences and peace and well-being?